Game description: Marvel's first family of Super Heroes face its greatest challenge yet as the enigmatic, intergalactic herald, The Silver Surfer, comes to Earth to prepare it for destruction. Transform into any member of the Fantastic Four to fight enemies from the Fantastic Four Universe including Silver Surfer, Super Skrull and more. 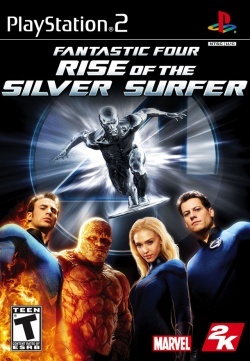 Based on the film of the same name and stars the Marvel Comics characters Fantastic Four and the Silver Surfer.